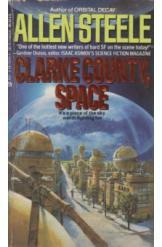 Clarke County Space by Allen Steele Sci Fi. Book in a good condition, all pages intact. A gripping tale about Clarke County, mankind's first orbiting space colony that attracts a diverse group of people, hackers, hit men, settlers, tourists and even the Church of Elvis. A piece of the sky worth fighting for.